The French were forced out of Indochina during the 1950s but their legacy remains, with the most notable feature being the old buildings that bear their architectural stamp. In the late 19th century, the French began to colonise Indochina and by the early 20th century they controlled vast areas of Vietnam, Laos and Cambodia. In Laos, some old French buildings can still be seen in the capital of Khammuan province – Thakhaek district – which is located along the Mekong River in central Laos. On the opposite side of the river is Thailand’s Nakhon Phanom province. Much of the architecture in the old part of Thakhaek is of French origin after numerous buildings were constructed in the early 20th century. They used to be brown in colour but over the years many of them have turned black. Some people say the black is not because of the way the buildings have been painted, but because they have become weathered and never been repaired or repainted. “See these old buildings – sometimes they look like something out of a drawing by a famous foreign artist,” one observer noted. The town’s name in Lao means “guest landing”, with the word “khaek” literally meaning guest. The word “tha” is a reference to the town’s earlier role as a landing stage for the boats of foreign traders. The heart of the old town is a square with a fountain near the river, where many old buildings still stand. The old town was centred around a broad medium-size plaza that stretched away from the river for a couple of blocks. 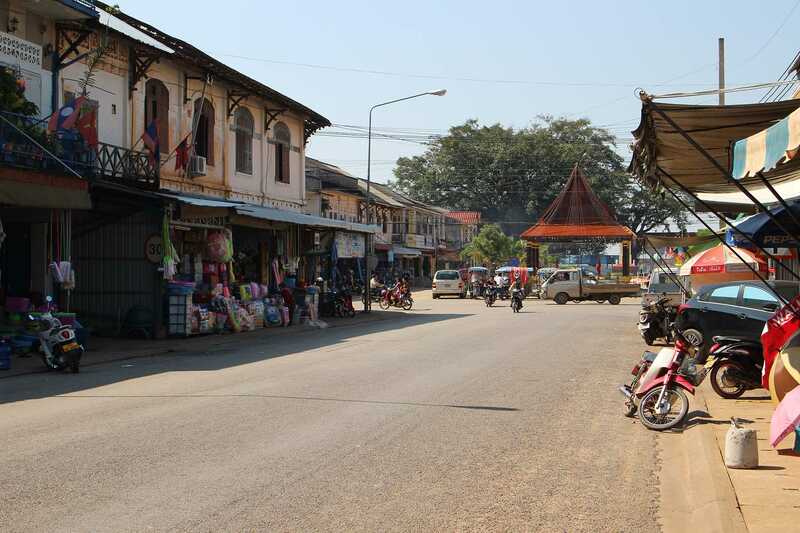 During the French colonial period, Thakhaek was an important town, especially for trade along the Mekong. As a result of the strong French presence, there are still many French-style buildings around the town. Domestic and foreign travellers with an eye for architecture can spend many pleasant hours walking around Thakhaek and mulling over days gone by. Most of the interesting buildings are within five or six blocks of the main square, in either direction. Visitors can easily make a loop walking along the riverfront, or one block away from the river, until they get to the end, then heading over one block further in and walking back. About 15 French-style buildings have been preserved due to their historical and cultural interest, and their demolition is banned. The buildings are a tourist attraction and their conversion into restaurants or guesthouses has generated income for local residents. Also of interest in Khammuan province are Khamphaeng Hin (Khammuan’s Stone Wall), Sikhottabong Stupa, Buddha Cave and Hua Phou Sout (a scenic viewpoint). Khammuan is located about 300 km from Vientiane. Public and private buses run to and from Thakhaek bus station every day and night. In early 1946, French troops occupied several areas of Thakhaek district. Prince Souphanouvong, who became the first president of the Lao PDR when the nation was liberated in 1975, bravely led the people against French attempts to retake the town. He fought courageously but did not manage to defeat the French. On March 21, 1946, President Souphanouvong ordered those who remained after the battle to cross the Mekong River to Thailand. President Souphanouvong later returned to Laos and continued to work for the liberation of the country with other Lao leaders.